Shout it out! I’m a Guided Inquiry Design Practitioner! 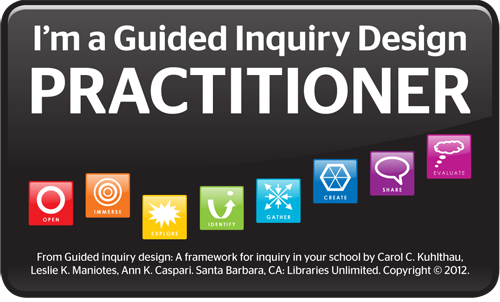 We encourage you to promote yourself as a Guided Inquiry Design Practitioner. Embed the following badge on your email, blog, website or CV to let colleagues and potential employers know you are a Guided Inquiry Design practitioner. Please include attribution to sybasigns.com & Kuhlthau, C.C., Maniotes, L.K., & Caspari, A.K. (2012). Guided Inquiry Design: A framework for inquiry in your school. Santa Barbara, CA: ABC-CLIO. with this graphic. Or, copy this HTML code and paste it in your website, or blog!